This month we lead into the New Year with a fascinating article by Exotics Editor, Charlotte Hitch, on the news that SeaWorld have developed a treadmill for orcas in an attempt to improve their welfare, a very topical subject. Following the August release of the critical documentary entitled Blackfish, which depicted the less than desirable lives of captive killer whales forced to perform in popular sea life parks such as Loro Parque in Tenerife and SeaWorld, there has been an outburst of controversy over the ethics of keeping such intelligent, emotionally complex animals confined to small, concrete tanks. In response to this wave of criticism, SeaWorld announced in September that they were working towards a killer whale treadmill, as a way of encouraging their orcas to exercise more and to supposedly add some interest and entertainment to their otherwise desolate tanks. This machine is essentially a pump which will produce currents which the whale can swim against, simulating swimming in a straight line. While some claim this is a good idea, for the majority, it seems like an attempt to improve public relations, instead of addressing the real issue at hand: orca welfare. One of the main problems that arise when keeping an animal as large as orcas in captivity is, inevitably, space. A fully-grown wild orca is capable of swimming 100 miles in a day, and for a captive orca to swim this distance it would have to circle the perimeter of the main tank at SeaWorld 1900 times. A further problem is the depth of the tanks in sea life centres; only two of the seven tanks at SeaWorld Florida are deeper than their largest bull orca, Tilikum, is long. Captive orcas are hence deprived of the freedom of a three dimensional world in which they can exhibit natural behaviour, and are forced to swim endlessly around the same pool, an activity which lacks mental stimulation. In captivity, the complex social needs of these intelligent whales are almost always overlooked or misunderstood. Orcas are kept in incompatible groups with others from completely different social groups, and mothers and calves are often separated far too early. It has been reported that in the wild, calves can stay with their mothers for life, aiding in the nursing of further calves and forming complex emotional bonds with a part of their brain which even humans have not developed, which has been linked specifically to their social and emotional capacities. Early separation of calves from mothers in order to sell them to or exchange them with other sea life centres can cause a huge amount of emotional grief and even depression, resulting in poor health and aggressive behaviour towards both other orcas and trainers. Frequent swapping of orcas can result in incompatible animals coming into contact, risking aggression and fatal clashes, which have already claimed the lives of many captive orcas. Furthermore, the physical needs of these whales are very often neglected. They are fed an unnatural diet of thawed frozen fish as well as beef and pork bones to provide gelatine in order to keep them hydrated. The lack of variety in their diet can often cause vitamin deficiencies, and killer whales are therefore often given supplements as part of their normal diet. Orcas damage their teeth by chewing on metal and concrete edges of their enclosures, most likely out of boredom, and some require painful procedures known as pulpotomies (drilling of the soft, inner part of the tooth with blood and nerve supply), leaving open channels for pathogens to enter the bloodstream. Multiple captive orcas have died of septicaemia, and it seems that the poor dental condition of many orcas may have been a likely cause of this. Dorsal collapse, where the collagen structure inside the dorsal fin progressively degenerates, is also a common implication of a poor diet and too much time spent at the surface of the water. One of the primary reasons for keeping orcas in captivity, SeaWorld representatives argue, is for educational purposes. Sadly, there is a worrying lack of public knowledge about the species and the conditions in which they live in captivity, with publically available post mortem reports claiming that an 18-year-old orca died of ‘old age’, despite female orcas being capable of reaching the age of 90 years in the wild and males only slightly less. The median survival time in captivity is only 4 years, yet SeaWorld employees are forced to tell visitors that orcas live longer in captivity than in the wild. How can the captivity of orcas possibly be used as an educational tool if SeaWorld and its staff lie to the public on a daily basis? 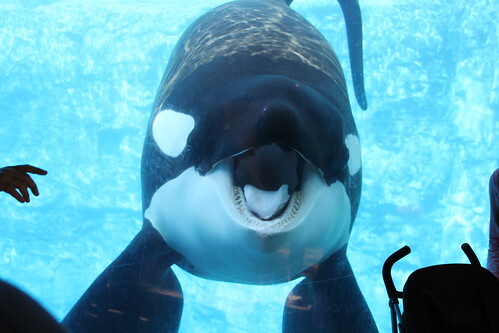 The figures for life expectancy in captivity indicate that orca captivity is, more often than not, unsuccessful. The problems highlighted show that there is a lot more to improve than simply the orcas’ physical fitness, so while orca treadmills may be a small improvement to their quality of life, orcas are still going to be kept with incompatible tank mates, have poor dental health, be mentally unstimulated and bored to the point of causing harm to themselves or trainers, and be forced to perform in public shows. Despite the efforts of SeaWorld to produce a machine which will make it acceptable for orcas to be kept in captivity, it seems that as long as they are kept away from the open environment of the ocean, their quality of life will always suffer compared to that of wild killer whales. Blackfish. (2013). Documentary. Directed by Gabriela Cowperthwaite. USA: Magnolia Pictures. Carwardine, Mark (2001). Killer Whales. London: BBC Worldwide Ltd.